Kien Giang (VNA) – Vo Van Thuong, head of the Communist Party of Vietnam (CPV) Central Committee’s Information and Education Commission, received Kikeo Khaykhamphithoune, head of the Lao People’s Revolutionary Party (LPRP) Central Committee’s Commission for Propaganda and Training, in the Mekong Delta province of Kien Giang on August 2. 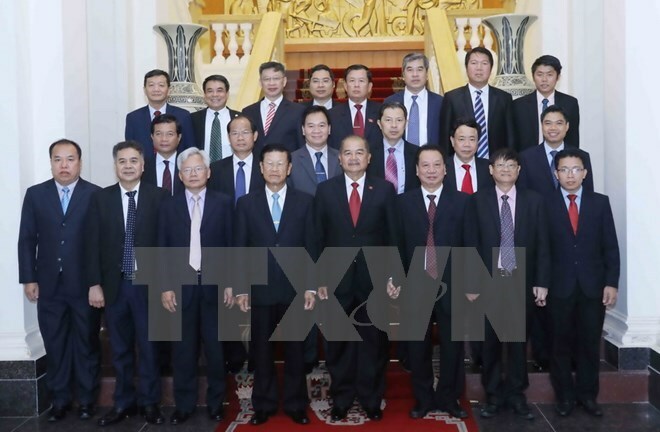 Kikeo Khaykhamphithoune, who is also President of the Lao National Council for Social Sciences, is in Vietnam to attend the fifth theoretical workshop between the two Parties. At the meeting, Thuong expressed his belief that the workshop, together with other activities marking the 55th anniversary of the bilateral diplomatic ties and 40 years of the signing of the Vietnam-Laos Treaty of Amity and Cooperation, will help boost the special solidarity between the two countries as well as cooperation between the two Parties in a practical and effective manner. Host and guest reviewed collaboration between the two commissions over the past time and discussed measures to enhance the affiliation in the time ahead. They agreed to closely work with each other in implementing agreements reached by the two countries’ leaders and increase the exchange of information and experience, thus contributing to strengthening the traditional friendship, special solidarity and comprehensive cooperation between Vietnam and Laos. The same day, Kikeo Khaykhamphithoune had a working session with Vice Chairman of the CPV Central Committee’s Theoretical Council Phung Huu Phu.